I am the first Jinora fan. ^You forget an interesting thing called lying. It hides the truth. Many people believe he is not being honest. I personally don't want him to be voicing Zuko, but I would like to see him as an old man. We will not be quiet. Or was there new info that I missed? The Blue Knight – the first English Blue Exorcist forum! ^ If he was Zuko, it would actually be worthy of the surprise it was made out to be. A relative of Zuko...not so much. Depends on the circumstances. 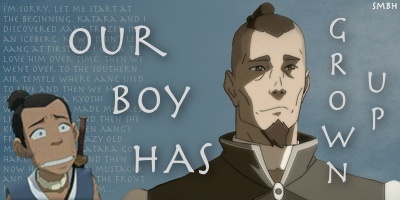 If he was Zuko's waterbending grandson it would be surprising. Just wanted to let everyone know that there are another group of title screenshots supposedly from Book 2 floating around Tumblr, but Bill Rinaldi has confirmed them as fakes. ^I seriously laughed at those titles, they sounded so ridiculously fake. Ha, the title Endgame makes sense, because Tenzin said something about Amon playing his endgame in Episode 10.